The College of Commissioner Science is a commissioner conference held the first weekend in December. The college is a format modeled after college courses and degrees. This format also uses the conference to encourage a continuing education experience for commissioners. The purpose is to provide ongoing practical training for all commissioners. The following Distinguished Commissioner Service Awards have been awarded in Sam Houston Area Council. 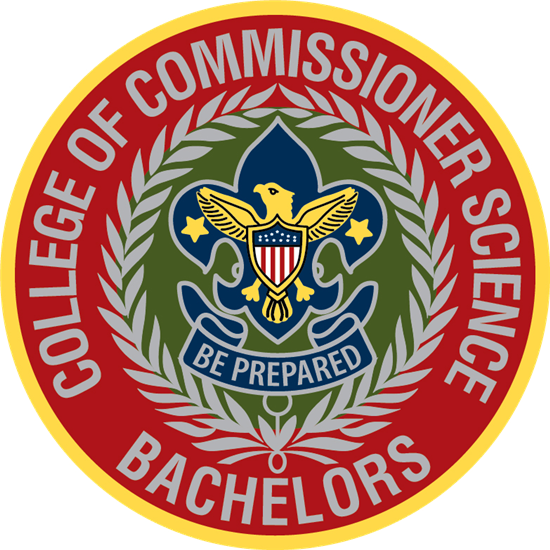 The Bachelor of Commissioner Science (BCS) is an entry-level program for commissioners who have completed basic commissioner training. 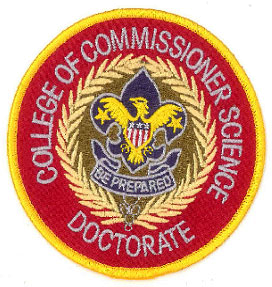 Courses are offered at the College of Commissioner Science. Completion of commissioner orientation (Commissioner Fieldbook for Unit Service and Commissioner Fast Start). Completion of Commissioner Basic Training. Completion of seven courses of instruction, at least five of the courses at the bachelor’s program level. Approval of councilor assigned assistant council commissioner. Approval of Scout executive or adviser to commissioner service. 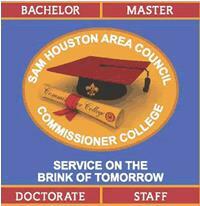 The following Bachelor of Commissioner Science degrees have been awarded in Sam Houston Area Council. Arthur Balis Mary Foremano.o.c. Sherry Millero.o.c. John Caldwell Casey Johnson Robert Sanderso.o.c. John Paul Chauvel, Jr.o.o.c. Gene Manuel Max O. Smith, Jr.o.o.c. Clive Choato.o.c. Dennis Mattli Rhondalon Smitho.o.c. The Master of Commissioner Science (MCS) offers advanced problem solving and administrative skill instruction for commissioners. Courses are offered at the College of Commissioner Science. Completion of bachelor’s degree or have been awarded the Commissioner’s Key. Completion of seven additional courses of instruction (total of 14), at least seven of the courses at the master’s program level. Approval of council commissioner or assistant council commissioner. Approval of Scout executive or staff adviser for commissioner service. The following Master of Commissioner Science degrees have been awarded in Sam Houston Area Council. The Doctorate of Commissioner Science (DCS) is a two-year program (DCS) that challenges commissioners to identify, develop, and present a project or service concept to a panel of their peers. Courses are offered at the College of Commissioner Science. Completion of 10 additional courses of instruction not used to qualify for other college awards (total of 24), at least five of the courses at the doctor’s program level. Completion of a thesis or projection any topic of value to Scouting in the local council. The topic and final paper or project must be approved by the dean of the doctor’s program and the staff adviser. Serve on the College of Commissioner Science faculty (instructor or support staff ) for at least one year. Recruit at least three new commissioners. The following Doctorate of Commission Science degrees have been awarded in Sam Houston Area Council.